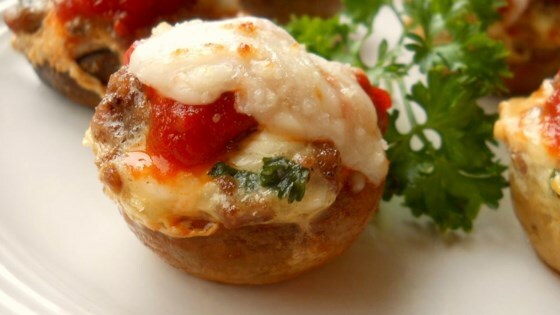 "Mushrooms stuffed with all the goodness of lasagna, without the noodles!" Preheat oven to 375 degrees F (190 degrees C). Spray an 8x8-inch baking dish with cooking spray. Cook and stir the ground beef in a skillet over medium heat, breaking it apart as it cooks, until the meat is no longer pink, about 10 minutes. Mix together the cottage cheese, egg, green onion, parsley, and salt and pepper in a bowl until the mixture is well combined. Stir in the cooked ground beef. Place the mushrooms, hollow sides up, close together in the prepared baking dish. Spoon about 1 tablespoon of the cheese filling into the cavity of each mushroom, and allow remaining filling to overflow between mushrooms. Bake in the preheated oven until the cheese filling is set, about 15 minutes. Remove dish from oven, and spread the pasta sauce evenly over the mushrooms. Sprinkle an even layer of mozzarella cheese over the sauce, return the dish to the oven, and broil until the cheese is bubbling and beginning to brown, about 5 more minutes. Let the mushrooms stand 5 minutes before serving. Get all the flavors of lasagna in one delicious hand-held bite! Edible but no rave reviews. This sounded like a perfect combo for my family but it just wasnt great. Almost as much work as regular lasagna and we'd much prefer that anyway. I used regular white mushrooms because I wanted them to be bite size. AMAZING!!!! I used a teaspoon to take the stems out and a frosting bag to pipe in the filling. WORTH IT! I made this recipe over the weekend. It was surperb! We loved it. Very easy and made a whole meal with a small salad.